Spacious 1 Bedroom + Den Condo At Vu By Aspen Ridge. 818 Sq Ft On High Floor. Functional Layout With Breathtaking City View. Luxurious Finishes Inc 9 Ft Ceiling, Floor-To-Ceiling Window, Granite Countertops, Stainless Steel Appliances & Laminate Flooring. Steps To St Lawrence Market, Financial District, Eaton Centre, 24 Hr Street Car. 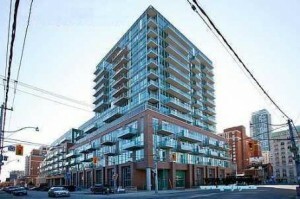 Minutes To Hwy & George Brown College. Fabulous Amenities In The Building. Stainless Steel Fridge, Stove, Dishwasher, Microwave, Washer, Dryer.